Here I am back after this looong summer with new recipes! And I am so happy to start with this really amazing recipe that I hope is going to be a staple in your home as it is already in mine. My 7 years old son devours them and he always is a good “indicator” when I am testing recipes… so yes, they are a great alternative for the whole family when you want to have a better snack than the ones you find in the market. I have to admit that this recipe has been the result of buying the wrong flour. I wanted to make the chickpea nachos from My New Roots, and when I came home from the market, I realized I had bought corn flour instead…ups. So there I was with all the ingredients but the main one was not the good one. Suddendly I thought that well, tortilla nachos are made traditionally from corn so why not try another version with it? So I started thinking about the flavours of the comercial ones, that salty, smoked, sometimes with cheesy or other artificial flavours. To my mind came the nutricional yeast to match that cheese asociation and paprika. In Spain we have a traditional one called Pimentón de la Vera, the most famous one but I used a Majorcan one called Pebre de Cortí. I also added some dried onion and hot water to make the flour easier to work with as when you make corn tortillas. You could surely add a more mediterranean touch with rosemary, oregano or thyme or even curry or dried garlic for example . The most important thing is to buy corn flour not polenta, and above all NOT instant polenta. I have the chance to be able to buy a fresh milled local corn flour and the results where really good, so try to find a good quality flour. They are very easy to make but be sure to roll the dough really thin in order to have really crunchy nachos. They will last more than a week with that texture if well kept in an airtight container. 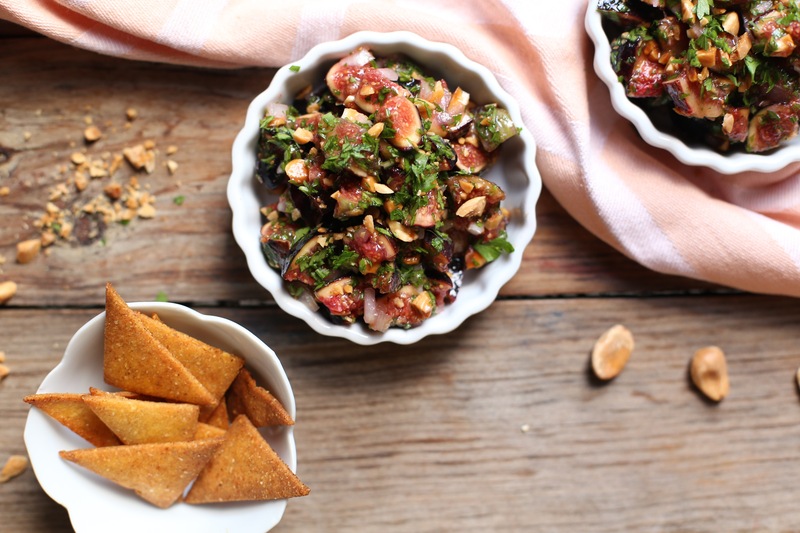 The fig salsa is a micro recipe that I made up one afternoon using all the fig bounty. You can surely use any other fruit in season like peaches, plums or mango and add some fresh coriander too. I love its sourness in contrast with its sweet and salty touch. But above all it is just an idea, because the nachos are the perfect companion for any other dip like a good guacamole or hummus like this one or this other one or even this one! I hope you really enjoy this recipe as much as I do. Share the nachos with your friends next time you have a dinner or picnic as a great way to create awareness to make homemade goods! Start with the nachos´s recipe by turning the oven on at 175ºC. Boil the water and set aside. Blend together the nutritional yeast with the onion until you haver a fine powder. Wishk it in a bowl with the corn flour, salt and baking powder. Add the olive oil to the hot water stir, and pour over the dry ingredients. Mix with your hands until you have a beautiful non sticky dough. Be careful if the water is still very hot! Divide the dought in two balls. Place one between two parchment papers and roll it out as thin as possible up to 1 mm. Remove the top layer paper and do the same with the other dought. With a pizza cutter or knife, score the dough into triangles as shown in the pictures. Place them in baking trays and bake until the outer triangles are golden. Around12-15 minutes. Live them to cool and sprinkle the paprika. If the triangles in the center are not perfectly crunchy once cooled you can bake them two more minutes. Transfer them to an airtight container until you use them. 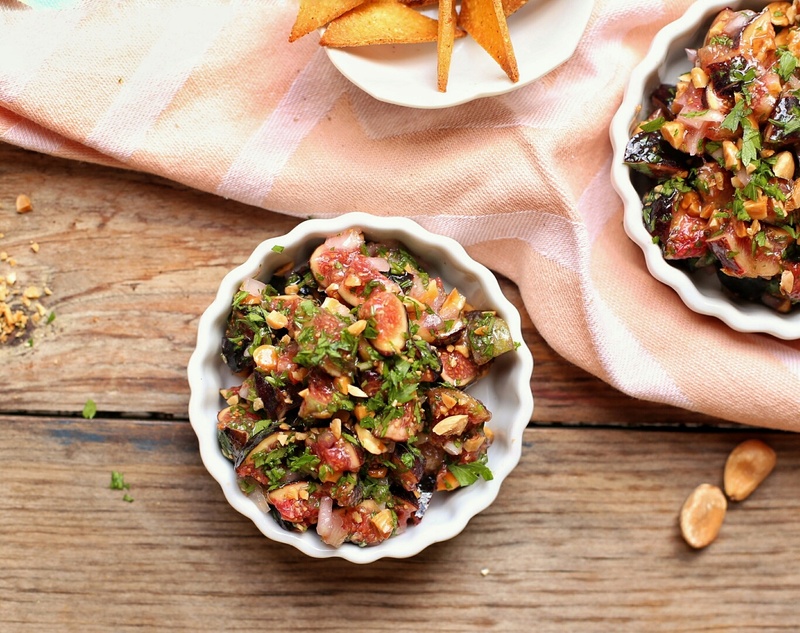 For the fig salsa you can use the heat of the oven to toast the almonds. Chop the onion and parlsey very thin and add them to a bowl. Cut the figs into quarters and then in half and add them to the bowl with lemon juice and salt ( and chili if you use). Let it rest for 15 minutes. Sprinkle the almonds before serving and enjoy it with the nachos! Gracias por compartir,todas estas maravillosas recetas.